On our next trip down to Cornwall we will be trying to save a bit of money by camping and doing our own cooking. One of the downsides of this is that we probably won't have a ready supply of electricity to recharge anything. Since there are quite a few things I would like to be able to recharge I decided to do some research and see what might be practical. The first priority was a phone charger because I want to be able to speak to Hel while she is traveling France on her own. She bought a wind up charger just in case but it is quite noisy, heavy and very tedious. Most phones, ours included, need 5 volts to charge. Because my Zaurus (cross between a PDA and a laptop) also needs 5V so this setup would keep me programming on our travels too. 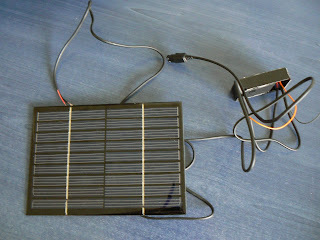 There are several commercially available solar chargers, such as the Solio or Freeloader that would do the trick. I bought a Solio a while back and was very disappointed as it came with a voucher for a free charging tip which not only took several months to arrive but didn't come with the cable necessary to use it. After spending £50 and waiting for months I had hoped to have something that could at least be used for something, anything really. I eventually took the plunge and ripped apart the iPod cable that did come with it and put it to some use but I'm still not impressed. The other things that we really want to be able to charge are batteries. The lights on my bike are all AA powered and although you can find them pretty much anywhere I don't like using disposables. The battery in Hel's camera is more of a problem as it is a custom design and can only be charged by the mains charger. The Solio and Freeloader are very good for charging devices, but not batteries, and the custom battery was going to require a custom charger. Thankfully during my search I happened upon www.reuk.co.uk which not only has several articles explaining how to build a fixed voltage solar charger for the devices, and a current limiting circuit for charging batteries, but also sells everything required to build them. 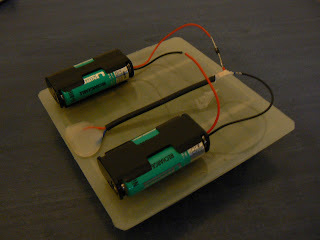 The most basic circuit is the 4 AA battery recharger consisting of a solar panel, the battery holders and a single diode. This is very easy to assemble and makes for an excellent starting project and costs around £20 including postage. I can now use rechargeable batteries in my lights, and I can also use the 4 AA batteries to charge my phone or Zaurus, but this indirect charging is very inefficient. The other problem with this setup is that the solar panel and batteries have to match each other so it isn't a very versatile solution. The slightly more complicated circuit involves a diode, a resistor and an LM317 which are used to limit the amount of current in a circuit. According to the site it is safe to recharge batteries with quite a high source voltage but to stop the batteries from being damaged (or exploding) it is necessary to limit the current to a tenth of their capacity rating (e.g. if you have a 1500mAh battery charge it with at most 150mA). I used a 9V panel as the camera battery is 7.2V. The final circuit I made was the voltage regulator so I could use the 9V panel to provide a steady 5V output to directly charge the phone or Zaurus. This used a diode, two resistors and an LM317. By driving both this circuit and the custom battery charger from the same 9V panel Hel now has a nice travel package weighing less than the wind up charger and spare batteries she was going to carry and costing under £25. I am very happy with my battery recharger and am now considering a slightly bigger setup so we can recharge our laptops. I just hope the sun sees fit to come out from time to time. What a good idea. I have a Zaurus sl5500 I am hoping to resurrect for biking and camping. It has a GPS attachment. What did you use to connect the battery pack to your Zaurus?